It only makes sense that we get asked a lot - "what kind of shoes do you recommend?" In some other cases - "can I keep wearing my high heels?" Or even - "is my pain because of my (new) shoes?" When recommending shoes to our patients, there are some basics and there are some more specific recommendations that you will get after your foot has been assessed. A rule that applies in ALL circumstances: Shop for shoes at the end of the day. Our feet swell and splay to some degree throughout our normal day-to-day activity and due to gravity. Shopping for shoes at the end of the day gives you the best idea of how much room you need in your shoes (when you need it the most) and because our feet are most fatigued at the end of the day, you will really know what will feel good and also which will not be too constricting. The other basic recommendations for buying shoes varies, based on what type of shoe you are looking for. 2. Test where the sole of the shoe bends. For people relying on their shoes for miles and miles of running, hiking or walking, the instep of the shoe should not bend. This is the next most important area of the shoe wear we get our support from and not having this support means that you (and the shoe) will wear out sooner. 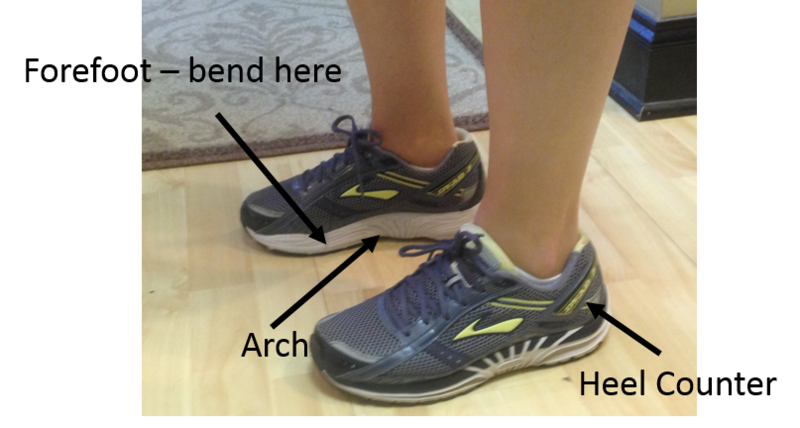 The place where these shoes SHOULD bend is in the ball of the foot area, across where your toes meet your foot, as you need to bend here during gait to complete propulsion. 1. If you can, refer to the rules above for athletic shoes - some workplaces allow you to wear these more supportive shoes, so taking advantage of this can save your feet from being squeezed into dress shoes. 2. If you have a dress code to follow and must wear a dressier type of shoe, look for one that comes with an insole that is removable - AKA, not glued into the shoe. This is hard to find, but if you can get this type of shoe, you can improve the integrity of the shoe with either an over the counter or custom arch support to prevent overuse injuries of tendons and ligaments in the foot. If the sole is glued down, make sure the insert within the shoe has a comfortable arch support. 3. A few words on heels: While we can't recommend these without reservation, wearing heels in some peoples' work is expected. Try to buy heels of various heights and rotate shoes to avoid wearing the same heel height every day. Wearing a high high-heeled shoe every day can cause shortening of your achilles tendon, which results in compensation throughout the rest of the foot. Also, having your ankle in this position predisposes you to ankle instability and can result in sprains and fractures. High heels place undue stress on the bones in the ball of the foot (stress fracture?) and can wear out the protective fat pad in the forefoot that naturally cushions the foot. Trying to keep heel height under 2" inches is also a good rule. 1. 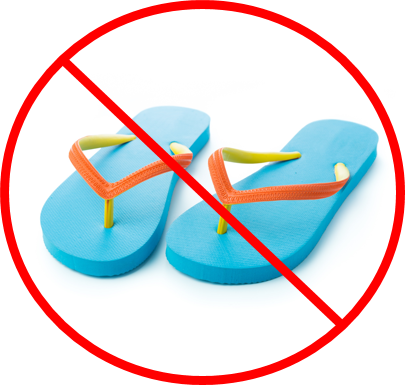 DON'T WEAR THOSE $3 FLIPFLOPS FROM THE GROCERY STORE/DRUG STORE/CLOTHING STORE/ANYWHERE! The most readily available and most affordable flipflops available have no support and can lead not only to tendinitis, heel pain and instability - they also (when worn chronically) can lead to hammertoe deformities and bunions in people whose foot type requires more support. If you do have a pair of these flipflops - about they only thing they are good for is wearing at the pool (once you are at the pool) to keep the concrete from feeling too hot on your tootsies on your short stroll to the pool edge to take a dip. The only "flip flop" type shoes we recommend are Spenco total recovery sandal or Orthaheel sandals. 2. If you are wearing sandals to an amusement park, water park, for a hike - look for sandals that have straps to keep them in place and make sure these straps don't hit on any prominences of your feet that could become irritated from prolonged walking. These sandals should also have some degree of arch support and a heel counter to hold you foot steady within the bed of the sandal. Make sure you lather on the sunscreen too - your feet don't get much sun the other times of the year (about 8 months if you live in the midwest). If you can't find them, your supportive gym shoes are truly the best option. The more specific shoe recommendations you may get from your podiatrist after your evaluation depend on your foot type. Some people need more stability, while others can go with a neutral shoe, and still others need more cushion than anything else. If you have had trouble finding shoes that work well for you, a quick visit allows your doctor to foot type you and give you more direction before you head to the shoe store!